NOW SOLD, SIMILAR CARS REQUIRED. 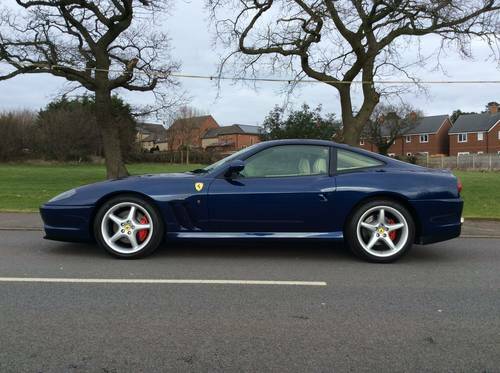 FERRARI 550 MARANELLO, TOUR DE FRANCE BLUE , FIORANO HANDLING PACKAGE, 17791 MILES. 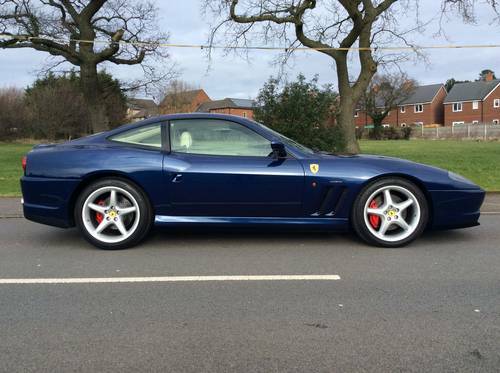 HILTON-BRIGGS SPECIALIST VEHICLES ARE DELIGHTED TO OFFER FOR SALE THIS EXCEPTIONAL LOW MILEAGE FERRARI 550 MARANELLO, TOUR DE FRANCE BLUE WITH THE RARE AND VERY DESIRABLE FACTORY FITTED FIORANO HANDLING PACKAGE. PRESENTED IN ARGUABLY THE FINEST COLOUR COMBINATION OF TOUR DE FRANCE BLUE METALLIC, BLUE CARPETS WITH CREMA AND SCURO LEATHER INTERIOR. 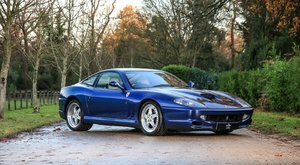 THIS RARE AND HIGHLY DESIRABLE 550 MARANELLO HAS COVERED A MERE 17791 MILES SINCE IT WAS FIRST REGISTERED BY FERRARI ( JCT ) LEEDS ON 08-11-99. THE COACHWORK, INTERIOR AND ENGINE BAY ARE IN TRULY REMARKABLE CONDITION, AS ONE WOULD EXPECT FOR SUCH A VERY LOW MILEAGE EXAMPLE. 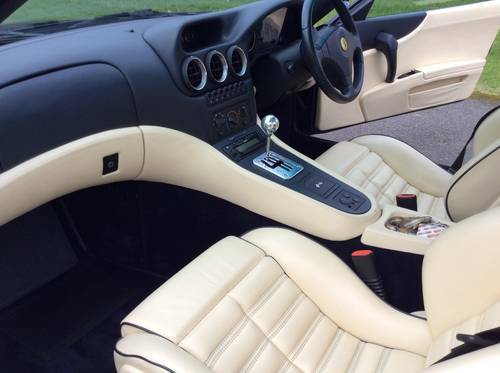 THIS BEAUTIFUL FERRARI IS SUPPLIED WITH ITS ORIGINAL LEATHER WALLET CONTAINING A FULL BOOK PACK, ALL MANUALS AND SERVICE BOOKLET CONTAINING DETAILS OF A VERY COMPREHENSIVE SERVICE HISTORY AND RELEVANT SUPPORTING DOCUMENTATION. PRIOR TO OUR PURCHASE OF THIS BEAUTIFUL 550 SHE HAD BEEN SERVICED BY MERIDIEN FERRARI AT WHICH POINT THE CAM BELTS AND AUXILIARY BELTS WERE REPLACED, WE HAVE JUST HAD A MAJOR SERVICE CARRIED OUT BY A HIGHLY REGARDED FERRARI SPECIALIST, EVERY SINGLE ITEM HIGHLIGHTED FOR REPAIR/ REPLACEMENT HAS BEEN ADDRESSED, SHE IS JUST PERFECT AND READY TO BE ENJOYED. 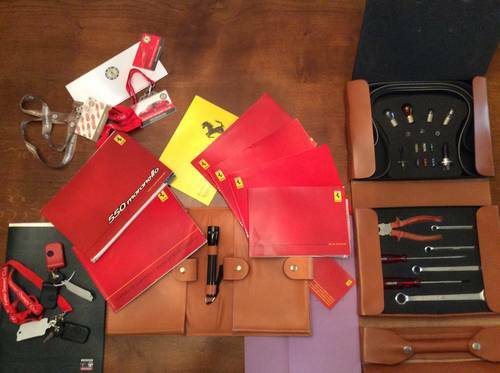 UNTOUCHED FERRARI TOOLKIT IN ITS ORIGINAL LEATHER CASE STILL COMPLETE WITH SPARE BELTS AND ALL BULBS. BOTH KEYS AND ALARM TRANSPONDERS ARE PRESENT AS IS THE ALL IMPORTANT RED TRANSPONDER. 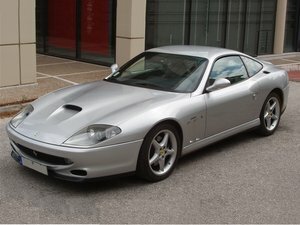 IF YOU ARE LOOKING FOR ONE OF THE VERY FINEST FERRARI 550 MARANELLO CARS AVAILABLE, WITH THE VERY BEST COLOUR COMBINATION AND SPECIFICATION, THEN LOOK NO FURTHER! 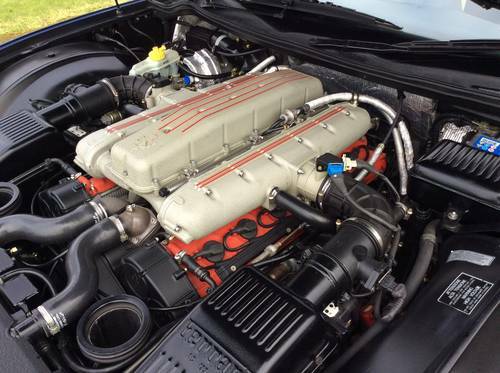 Ferrari 550 Maranello in very good condition with 65000km and full service history, original Belgian delivered car with all books and tools...very special color combination ! 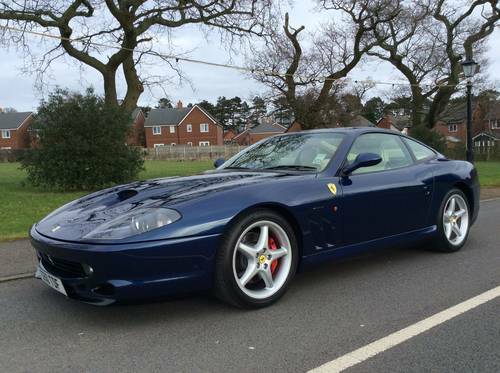 Very Very nice Maranello Manual gearbox 2000 Blue creme interior 66500 km Rosso corsa maintained 1 owner in Italy same owner in Switzerland 1 new owner in Holland Asking price; 95000,- euro's trade-in possible.